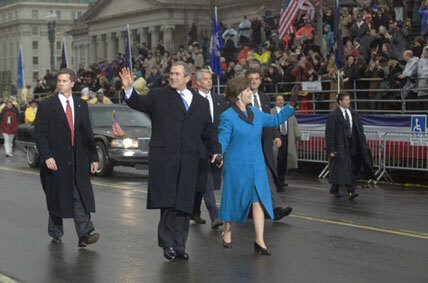 When a reporter asked if she would be a first lady more like Barbara Bush or Hillary Clinton, the new first lady replied, “I think I’ll just be like Laura Bush.” Pre-inaugural stories about Mrs. Bush cautioned against underestimating the quiet former librarian and teacher even though she did not express political ambitions or opinions. They detailed her tenure as the popular first lady of Texas and predicted that many of the initiatives that she instituted in the state—literacy and education programs and the annual book festival—would become national projects when she became the nation’s first lady. 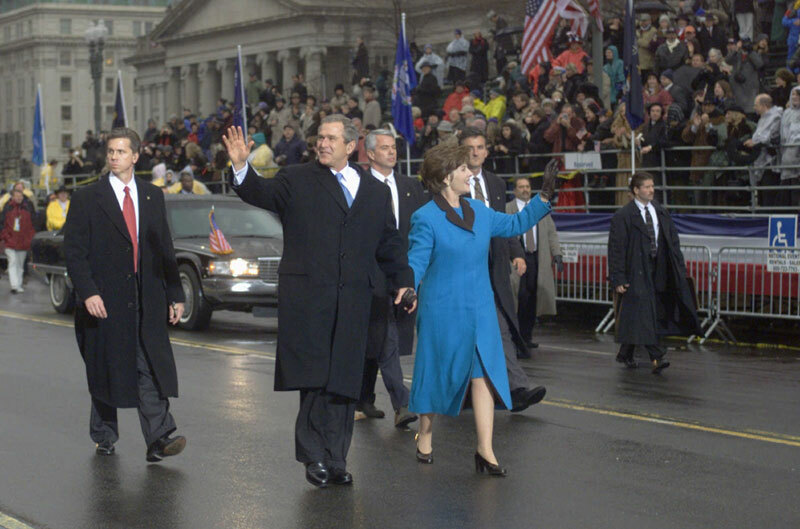 Noting her calm, quiet strength, and warmth while handling everything from entertaining to the wait for the 2000 election vote recount, the press anticipated Mrs. Bush’s role as the steady center of the Bush White House. 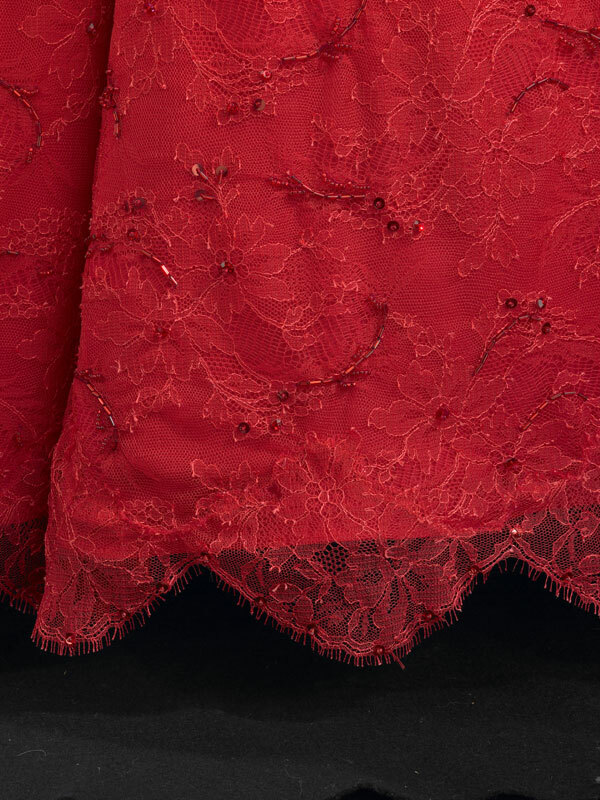 Laura Bush wore this ruby-red gown of crystal-embroidered Chantilly lace over silk georgette to the 2001 inaugural balls. 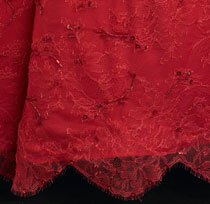 A sketch and description of the dress was released to the press two weeks before the inauguration. 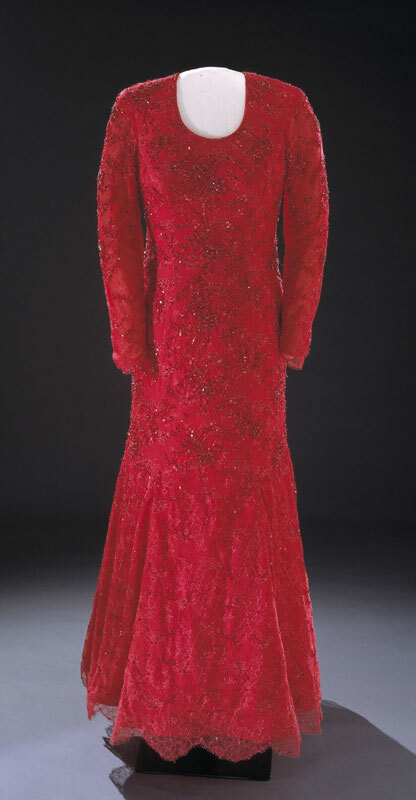 The dress was designed by fellow Texan Michael Faircloth. 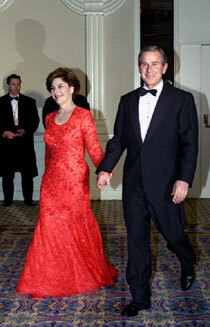 Some reports speculated that Faircloth encouraged the normally conservative Mrs. Bush to choose the brilliant color. 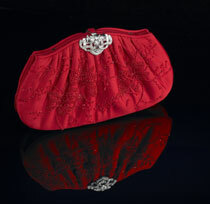 Laura Bush carried a purse designed by Judith Leiber to the inaugural balls.